Stroke recovery can be very focused on restoring movement, but stroke can have major impact on sensory systems. One of the most difficult to understand and manage sensory impacts is pain. A stroke survivor I know asked for my help because he felt trapped between two views of pain. His family and regular MDs were saying he wasn’t working hard enough on his therapy, that “No Pain, No Gain” was the order of the day. His PT/OT therapists were saying, “If It Hurts, Stop Doing It.” Like many people early in their stroke recovery, he was suffering severe shoulder pain, just as I did, that made it difficult to progress in his therapy. He asked me who is right about pain and why. The truth of pain and stroke recovery is in the details of the specific movements and degrees of pain. Overarching rules like “If It Hurts Stop Doing It”, or alternatively “No Pain, No Gain”, generally do not serve you well in stroke recovery. The problem is that both positions are right depending on the details. You, your caregivers, and your family/support group have to gain a deep understanding of the details of how pain management must be undertaken in the context of balancing neuro components, such as nerve connections establishment, maintenance, and growth, and ortho components, such as bone, joint, muscle, tendon regeneration, maintenance, and growth. Stroke starts out primarily as a neuro condition, but quickly adds ortho conditions. Muscles, joints, tendons, etc, decline rapidly with the loss of their neuro connections, loss of movement, and in the face of tone. The difficulty in setting a general rule is that both neuro and ortho systems need to heal simultaneously, and pain has the opposite effect in each of the two systems. Generally pain is never good for neuro healing hence the “If It Hurts Stop Doing It”. 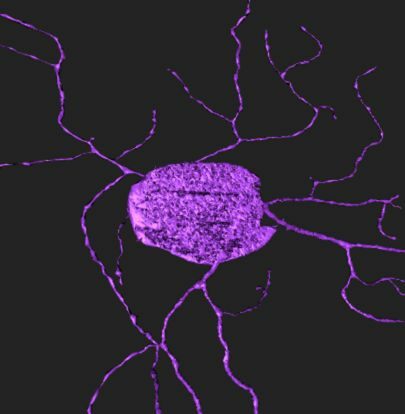 Pain tends to overload already overloaded new and fragile neurons. Pain also kicks up tone making it harder to execute normal movements with weakened muscles. In the early recovery, 3 to 6 months, PT/OT are very focused on neuro. But just the right amount of pain (and the right amount of movement) is widely believed to an essential element in triggering the ortho healing process. As a result, the very pain that helps ortho healing can be blocking or even undoing, neuro healing. I began sorting this out by looking at the “optimal” amount of pain from the ortho side, to which there are a wide range of opinions and is the subject of a lot of ongoing research. My research and experience led me to conclude that pain associated with therapeutic movement should never exceed 4 on the 1 to 10 pain scale. The number 4 is also the maximum pain number recommended by Dr David Pascal, DC when counseling his Olympic and TeamUSA Track and Field athletes recovering from the routine injuries of competition. The optimal pain level for uninjured muscle building and fitness is generally believed to be higher than the level for therapeutic movement. Therefore, No Pain No Gain may have some applicability to therapeutic movement, it is a saying most applicable to uninjured muscle building and fitness. When considering the pain scale, keep in mind a person recovering from stroke often feels pain more severely than they did before the stroke. I know I do. As a 60 year old triathlete I was frequently ignoring multiple aches and pains. I found that to be much harder to do after my stroke. Not only should the pain never exceed a 4 with therapeutic movements, but the pain should be stable and short. By “stable” I mean pain should not be increasing as you continue the movement and by “short” I mean you should keep the movements and associated pain to short intervals, say 30 seconds to a minute, followed by similar periods of rest and pain abatement. Then repeat. 10 to 15 movement repetitions in each set, 2 to 3 sets per session has a solid research basis as optimal for ortho. I set this as the max because, since all pain is bad for neuro, it makes no sense to exceed the pain level for benefit for ortho. Generally, early in your recovery, first 3 to 6 months, you should do less than this max. This level is considerably less than what is often envisioned and practiced under the conventional No Pain, No Gain principle. We have discussed the “pain” side of the No Pain No Gain principle, but the “gain” has special considerations when applied to stroke recovery. While some muscle remodeling is always happening in normal muscle building or fitness training, the extensive amount of muscle remodeling is a major complication after stroke. In the context of stroke, muscle remodeling means that a large amount of muscle fiber is dead or dying because of the loss of its neuro connection and needs to be removed from the body. This is happening at the same time the replacement muscle fiber is being built by recovery therapy. In normal training you are mostly building new muscle fibers, in stroke recovery training you are removing dead and dying muscle fibers AND building new muscle, at the same time. Muscle remodeling is not well understood, but in my case I believe major muscle remodeling was continuing even 2 years after my stroke. Before the stroke I understood very well the relationship of effort and result in building muscle. After the stroke, my muscles continued to shrink no matter how hard I worked to build them. My belief is that remodeling will cause the rate of gain in muscle recovery to be much slower than what is normally seen in conventional muscle building and fitness training. With a heightened sensitivity of pain, and significant impediments to gain, No Pain No Gain principles have to be applied with great caution in the first few years of stroke recovery. It’s still true, but the degrees are all very different. Another pain issue is how it affects your sleep. Research has shown that a person over 50 makes half as much human growth hormone (which is the primary healing hormone) as a 25 year old, and while the 25 year old makes it all day long, the over 50 crowd primarily makes it during REM sleep. REM sleep (and the resulting human growth hormone) is critical to your recovery. Movements or positions that initiate pain should be avoided near bedtime. Pain, position, and comfort must be well managed at bedtime to get a good night’s sleep. If your No Pain No Gain is following you to bed, that’s not good. Err on the side of caution regarding pain. Too little pain will mostly delay your recovery, but too much pain will halt or even undo your recovery, especially in the first 3 to 6 months. Moving on from the high level conceptual views on pain, I have a few more specific thoughts based on my experience with shoulder pain. Shoulder pain is very common after stroke because the shoulder is almost entirely held in place by muscles. When the shoulder muscles go off line due to the stroke, the joint becomes very unstable. Pain can be an early warning system that the bones involved in performing an exercise are not in the proper position. The scapula (wing bone) is often the culprit in shoulder pain. 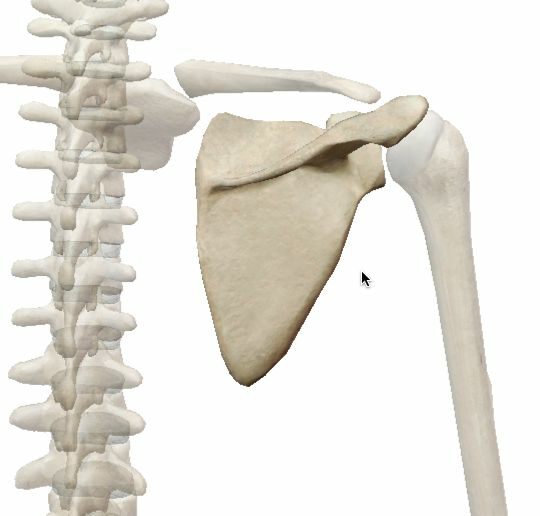 There is a depression in the scapula that the head of the humerus (upper arm bone) fits into. If it is not in the desired position, movement requiring the humerus, such as shoulder flexion, will be painful. Another aspect of this is muscle weakness. If the muscle that holds the head of the humerus in the socket is weak, gravity will allow the humerus to fall out of the depression in the scapula. After stroke shoulder pain often originates in the scapula. Not only is this painful, but any movement of the shoulder will be painful because the humerus is not in the scapular depression. Spasticity and/or weakness around the scapula can allow the scapula to tilt so that the head of the humerus is not positioned in the correct place to stay in the scapular depression. If an exercise is painful, the first place to investigate is your positioning. You may need to have your elbow supported to keep the head of the humerus in the scapular depression, the scapula’s position on the ribcage may need to be adjusted via facilitation or inhibition techniques to rotate or depress the scapula, your supraspinatus muscle may benefit from electrical stimulation, vibration or manual facilitation techniques, etc. There is a great APP called “Muscle Premium” that really shows all of this in 3D. Demonstrate your exercise technique to your therapist and have that person observe the alignment of the bones involved in the movement and your posture. Just being in a slumped position in sitting can throw off alignment of the scapula.Severe pain can actually inhibit muscle contractions or increase spasticity. Both of these responses are detrimental to your recovery. I struggled with this throughout my recovery. In the end it took traditional therapy by Steps For Recovery, AND special exercises developed by fitness guru Mike Barker and several treatments by Dr Pascal, DC. Once I got all 3 of them on the “scapula project”, my shoulder pain quickly resolved and my recovery progress improved significantly.